August 29, 2018, 10:52 a.m.
YouGov Omnibus research commissioned on behalf of Positive Money indicates that ten years after the financial crisis, trust in banks remains low. 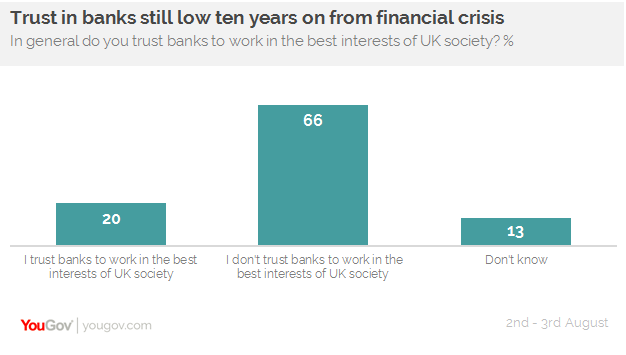 The study revealed that two thirds of British adults do not trust banks to work in the best interest of society, as opposed to the 20% that think they do, and 13% that don’t know. Notably, those in the youngest age group (16-24s) are most likely to think that banks do work in the best interest of UK society, with 38% believing they do. Comparatively, only 17% of those aged 55+ think in the same way. The survey also asked respondents to think back to the financial crisis that occurred during 2007-2008. More than seven in ten (72%) said that from what they know, banks should have faced more severe penalties for their part in the crisis. Just 12% believe they faced the correct level of penalties, while 1% thought the action should have been less severe. Looking to the future, over six in ten (63%) are worried that banks may case another financial crisis at a point in the future, with only 27% not worried. But satisfaction of banks remains high - while Impression score is improving. However, it must be noted that separate YouGov research does indicate that the public&apos;s satisfaction with their bank is high. 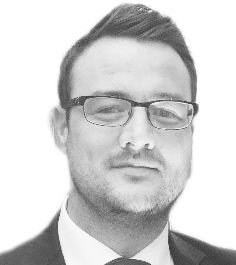 YouGov&apos;s Reputation of Banking report 2017 reveals that the majority of people (70%) are satisfied with their bank and the majority (62%) would be willing to recommend their bank to a friend or family member. Similarly, YouGov BrandIndex data shows that taken together, the banking sector&apos;s Impression score (whether you have a positive or negative impression of a brand), has improved significantly since 2012.